Steelworkers lined the streets of Brussels earlier this year to call on the European Commission to extend its support for EU steel and buffer the waves upon waves of cheap Chinese steel flooding the market. Numbering in their thousands, the people on the ground – executives among them – called on those on high to ‘save our steel’ and deploy the full range of their trade instruments to prevent steelmakers from drowning in the oversupply. Whether or not the Commission will act is an issue that hinges, in part, on the bloc’s resilience and on China’s accession to market economy status (MES). Until then, the survival of European steel, not to mention the hundreds of thousands of jobs in the industry, hangs in the balance. With no barricades to stop the rush of cheap – and mostly unwanted – steel, steelworks across the continent have been decimated by China’s overcapacity. The UK steel industry alone shed 5,000 jobs last year and, in January, widespread ‘dumping’ was cited as the reason for spiralling losses in Wales, Northamptonshire and County Durham. At Britain’s biggest steel plant in Port Talbot, the operation was said be losing £1m a day with little in the way of a response to the toxic mix of cheap supply and slumping energy prices. According to those with knowledge of the situation, a rash of Chinese imports depressed the price of hot-rolled coil steel – used primarily for cars – produced at the site, and with market conditions worsening by the day, job losses were (and are) all but inevitable. “I know this news will be unsettling for all those affected, but these tough actions are critical in the face of extremely difficult market conditions which are expected to continue for the foreseeable future”, said the plant’s CEO for Europe, Karl Koehler, speaking about the cutbacks. The situation in Port Talbot bears a resemblance to that of the Redcar steelworks – formerly owned by Tata Steel – in Teeside, which shut up shop in October after almost a century in action and shed approximately 2,200 jobs with it. Founded in 1917 and best known for producing the steel used to build the Sydney and Auckland Harbour Bridges, the collapse of Redcar had far-reaching consequences, not just for the plant’s parent company but also the community at large. ‘Ghost town’ is the phrase that springs to mind, and the fear is that this same fate awaits other steel towns across the continent and beyond. Unwelcome though it was last year, Koehler’s voice is now one of many speaking out against China’s impact on European steel. Asked by The Guardian about his position on European policy, he said his industry was not “asking for special treatment”. He added: “Instead, we are asking for the European Commission to stand up for fair trade and to give European steelmakers a chance to compete on a level playing field.” Assuming Koehler’s demands go unheard, we could soon see the death of a historic European institution. The steel industry has long held a strategic place in the European economy, and in areas like Port Talbot and Teesside it forms an important part of the community. Construction workers, automakers and electronics manufacturers are all regular customers, and any promise of improved infrastructure or energy efficiency is hollow without it. The “backbone for development, growth and employment in Europe” is how the European Steel Association (EUROFER) described the industry, for obvious reasons. And, with a series of critical infrastructure projects in the pipeline, its health is inextricably tied to that of the European economy. A world leader in innovation and environmental sustainability, the EU’s steel industry is second only to China’s, and accounts for 11 percent of global output – otherwise expressed as 177 million tonnes per year. With 500 production sites split between 24 EU nations, the sector is a key contributor to the economy and an important part of the region’s 2020 plans to up industry’s share of GDP to 20 percent. Unfortunately, this truly European industry now finds itself in a very difficult situation. According to the Commission’s Steel Action Plan, the crisis in Europe has led to a marked downturn in manufacturing activity and associated steel demand, which remains 27 percent below pre-crisis levels. Several production sites have closed or reduced output and up to 40,000 jobs have been lost in recent years. “The pressure to restructure and reduce production capacity will remain one of the main challenges for this industry in the foreseeable future”, according to the report. And a rising tide of cheap exports has done much to exacerbate the challenge at hand. Overcapacity, the report added, is not only a European problem. Forced to contend with low demand and cheap imports in an increasingly globalised steel market, the challenge for European steel has been compounded by high energy prices and the need to invest in the low carbon economy and innovative products. Having suffered considerably since the global financial crisis took hold, demand for European-made steel has slumped as much as 40 percent. And, while this structural overcapacity has largely been dealt with, producers are struggling to stay in the black. The global market for steel underwent a series of quite extraordinary changes at the turn of the 21st century, and industrialisation in Asia – principally in China – has put the continent way out in front as the biggest buyer and producer worldwide. While rising consumption in China has catapulted Asian steelworks to the top, Europe is fast approaching a crisis point. Since 2009, Europe’s steel industry has shed a fifth of its workforce and has tried (unsuccessfully) to improve operational efficiencies. The results have barely registered. Demand is still 25 percent short of its pre-crisis heights and policymakers appear all too happy to let Chinese mills dole out steel at below the price of production. With no need for the vast quantities of steel on its books, production in China is now said to be completely untethered from market demand. Signs of an approaching storm entered the frame this year when ArcelorMittal announced annual losses of almost $8bn, together with plans to raise $3bn in new capital to shore up its finances. As the world’s leading steelmaker, the Luxembourg-based organisation has suffered considerably at the hands of a collapse in prices. In light of this, the company has shown no hesitation in placing the blame squarely on China. Commenting on its disappointing results, ArcelorMittal’s Chairman and CEO Lakshmi Mittal conceded 2015 was a “very difficult year” and said the deterioration was due to “excess capacity in China”. In a conference call with reporters, he called the results “rather sobering”. At €6.3bn, the company’s market valuation is less than a quarter of the €27bn Mittal Steel paid for Arcelor in 2006, and Chinese exports could throttle it, and other European producers, should this trend continue. Familiar as they are with the commodities cycle, shareholders have watched ArcelorMittal’s stock lose 60 percent of its value in the 12 months to February, and the decision to raise a further $3bn – 40 percent of its market cap – has investors feeling nervous. Mittal insisted his company “has the right assets, the right strategy and the right balance sheet”, though unfortunately for him the answers to the company’s problems lie largely out of his control. To make matters worse, Wolfgang Eder, head of the World Steel Association, called the sector’s decline “inevitable”. Speaking in an interview with The Telegraph, he spoke about Europe’s overcapacity issue and stressed the importance of dialling down capacity as a “precondition for a solid base in the long run”. In the next 15 years, he said, Europe’s steel industry must halve in size and shed many more of the continent’s 330,000 jobs if it’s to survive the approaching storm. Lakshmi’s son, Aditya Mittal, was vocal about the failure of policymakers in Europe to protect steel and talked up the success of decision makers across the Atlantic and their ability to contain the threat. “Clearly the trade defence instruments that have been developed in the US are better”, he said, speaking in an interview with The New York Times. “They ensure a fairer, level playing field.” By his measure, and the measure of millions more across the continent, the Commission is not doing enough to protect European interests. However, it is not as if the Commission has been totally inactive. In 2013, it launched the ‘Action plan for a competitive and sustainable steel industry’ to fight off some of the dangers. The plan was to support demand for EU steel at home and guarantee access to non-EU countries through fair trade practices. The plan also set out to boost innovation and balance the burden of climate change policy. Of course, saving European steel is easier said than done, and many of EUROFER’s fixes require that a great deal more be done on the part of policymakers to shield producers from factors outside of their control. The decision to grant China MES, which Beijing says it has a right to after 15 years in the WTO, would give the country free rein to dump steel wherever it pleases. Yet doing so, according to the Economic Policy Institute, could put 3.5 million jobs at risk and result in 200,000 job losses. On the issue of EU-level action on dumping, critics maintain that the bloc takes too long to impose these measures. The imposition of provisional measures in the EU, for example, takes nine months, whereas in the US it takes five months and an initial decision can be made in as little as 45 days. What’s more, anti-dumping measures are not enough to offset the issues caused by Chinese imports, and lifting the Lesser Duty Rule (LDR), according to UK Steel, would not only remove the cap on anti-dumping and anti-subsidy duty levels, but bring EU practice in line with the rest of the world. All this being said, the issues for European steel offer only the slightest indication of the havoc China’s industrial overcapacity is wreaking on major economies around the globe. A report released in the days following the Brussels protest by the EU Chamber of Commerce in China warns overcapacity – not just in steel but across the gamut of heavy industry – is stifling economic reform and hurting trade relations. Impressive growth rates in years past have maybe distracted China from the issue of blind expansion, and policymakers are only now waking up to the repercussions. This issue, according to the report, is “wreaking far-reaching damage on the global economy in general, and China’s economic growth in particular”. As it stands, the rate of production, level of protectionism and lack of regulatory oversight are unsustainable, and without an immediate fix, China risks plunging itself and its trade partners into a crisis. 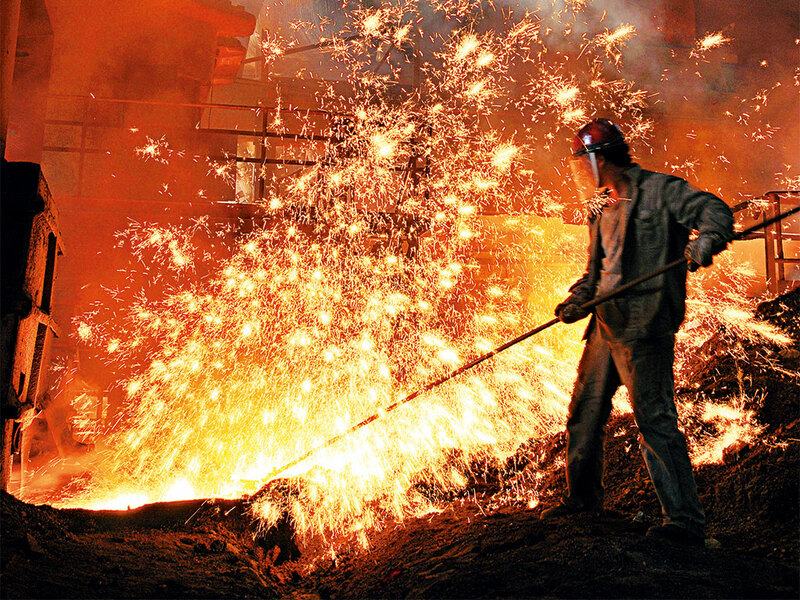 Certainly, Europe can ill afford to ignore the major issue of Chinese oversupply, and the continent’s steel industry will surely fall on the sharp side of China’s overcapacity problem without swift and decisive action to level the playing field. Should policymakers grant China free rein to offload steel as it sees fit, steelworks across the continent will suffer the same fate as Redcar and Port Talbot. Should they opt instead to clamp down on widespread dumping practices, steel companies could be spared an uphill battle of truly epic proportions.